Development is currently starting on the central axis of the new multimodal hub, which will channel all the flows of traffic meeting here, creating a new centrality for the site. 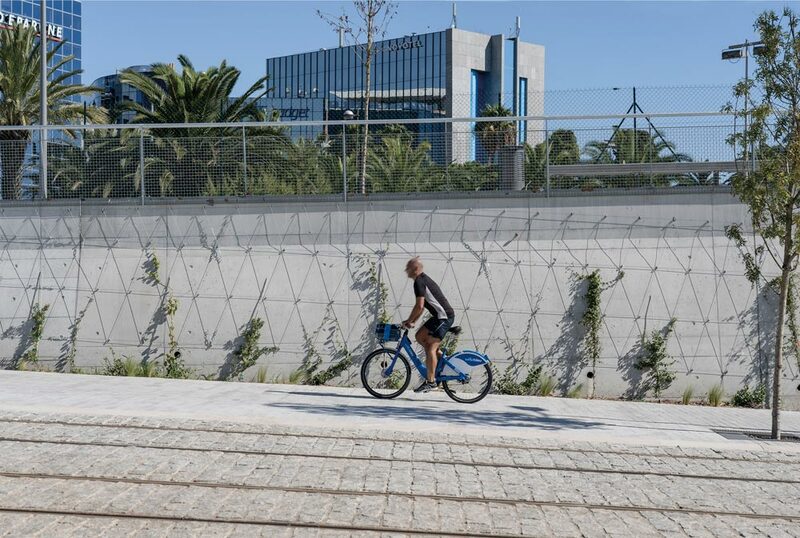 The traffic flows include the new tram system, buses, bicycles and pedestrians – different movements with different needs. 1. Unification of the horizontal texture formed by the pavements. 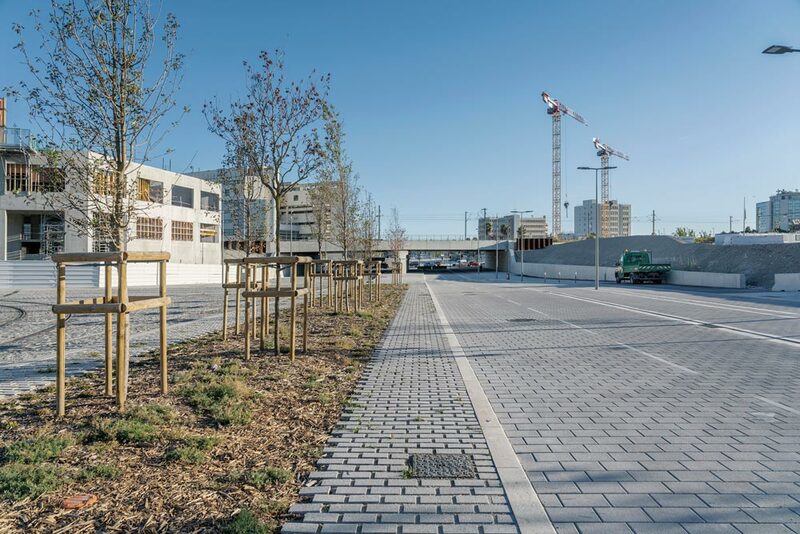 All the flows that cross the site are paved with natural or artificial stone. 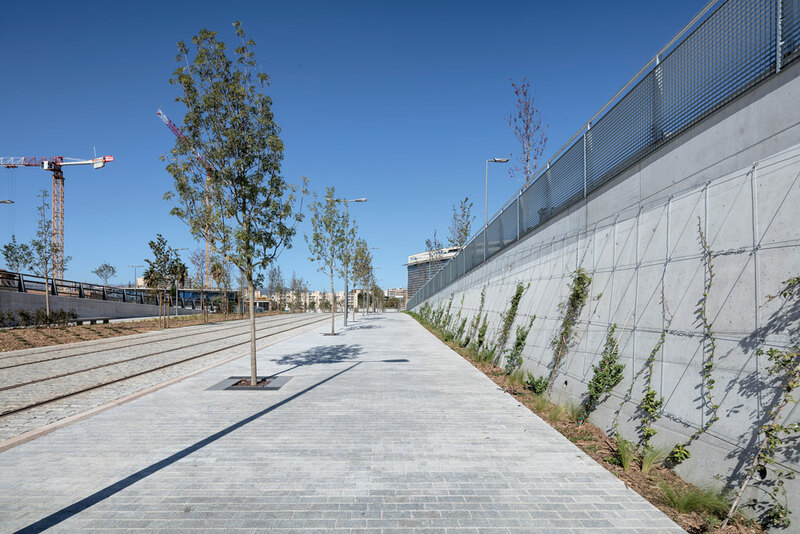 These textures are edged with sturdy blocks of light-coloured sandstone, which define the surfaces and create small differences in levels between them for safety reasons. 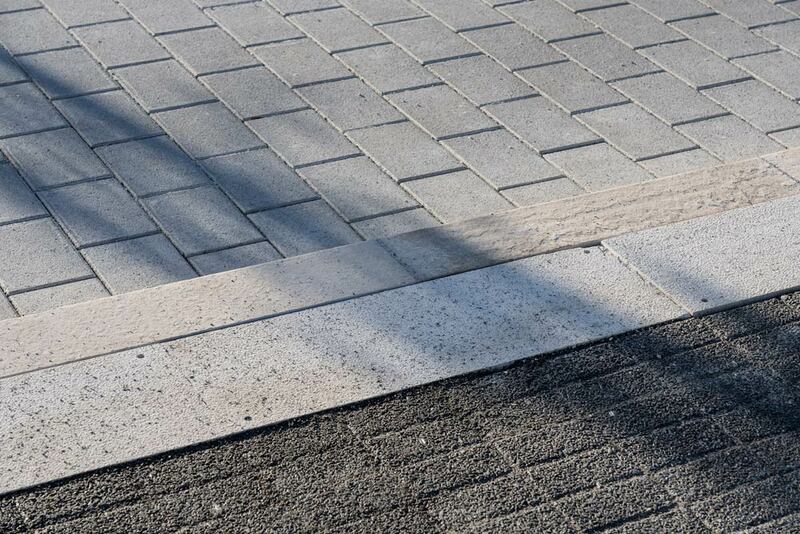 The resulting pavement is a continuous stone figure, outlined by the lines of the curbs and differentiated by aspects of size and quality, according to their conditions of use. 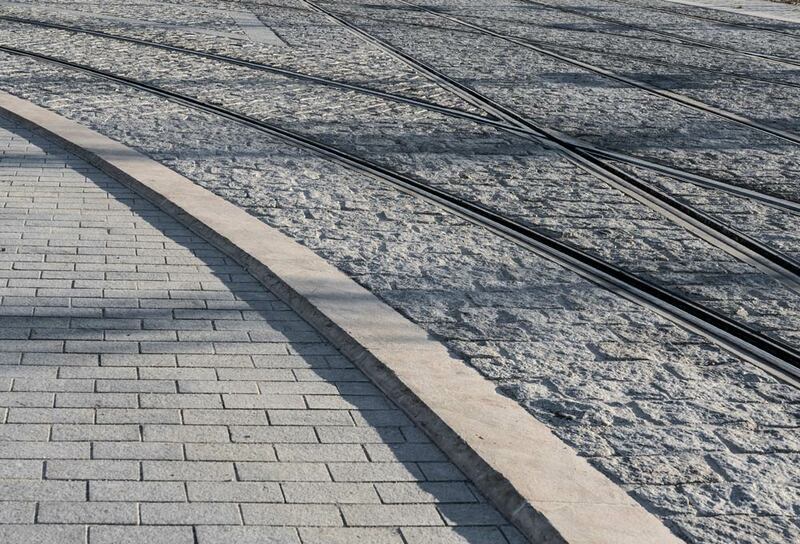 The space between the tram rails is occupied by very rough cobblestone (to deter pedestrians; the sidewalks are smooth granite pavers; and the bus and cycle lanes are made from self-supporting high-strength concrete blocks. 2. Introduction of vegetation onto this horizontal mineral base. Large trees along the pavements, a green central median, climbing plants on the side walls, a little park at the end point, etc. 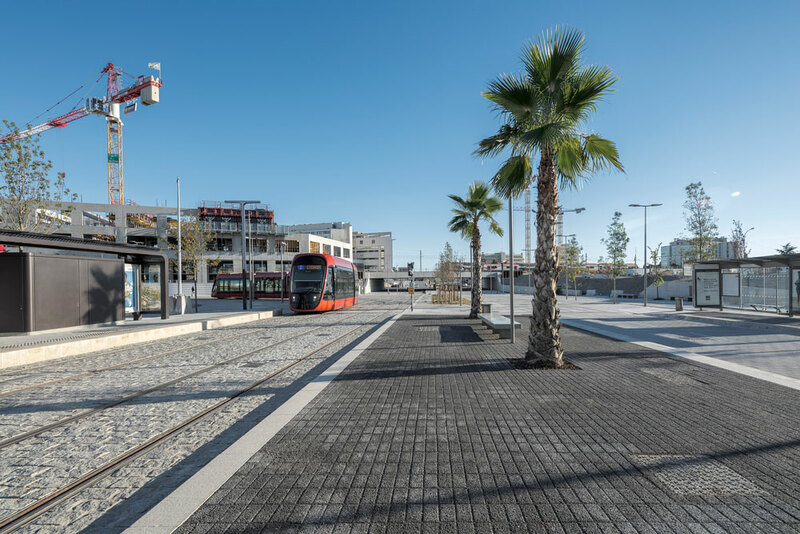 In the main axis of the new multimodal hub in the French city of Nice, a large expanse of urban cool paving has been created for the first time in Europe. 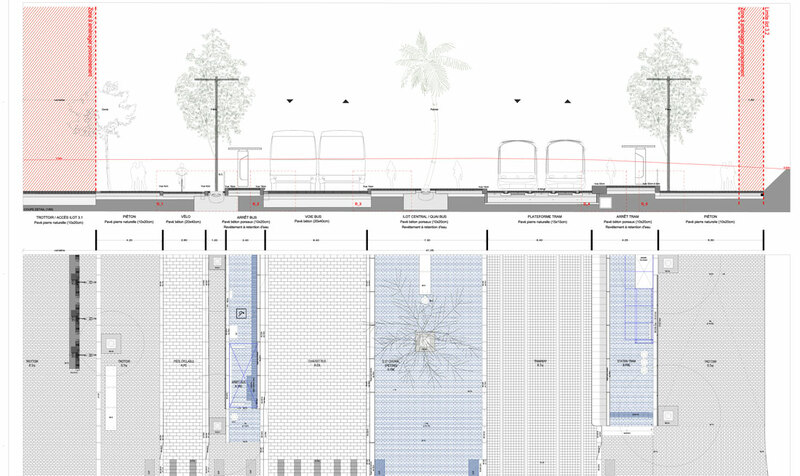 It corresponds to the areas of most intense pedestrian presence (bus stops, pavements, etc.) 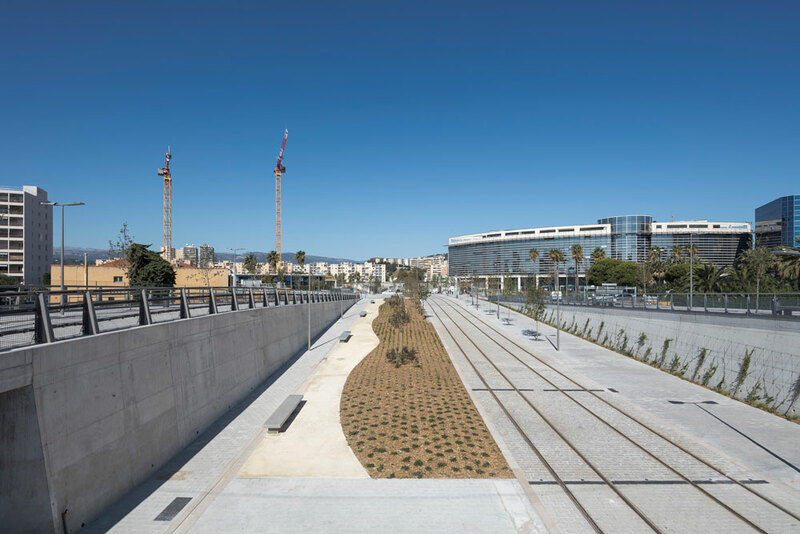 and represents an attempt to improve the thermal conditions of urban space in a hot climate like that of Nice.